A.M. Hammacher, Ren Magritte, New York and London, 1974, p. 49 (illustrated). H. Haddad, Magritte, 1996, p. 36 (illustrated). New York, Albert Landry Galleries, Ren Magritte in New York Private Collections, October-November 1961, no. 46. Minneapolis, Walker Art Center, The Vision of Ren Magritte, September-October 1962, no. 24. Magritte, as well as virtually all the Surrealists, was influenced by the writings of the Comte de Lautramont, the pen-name of Isidore Ducasse (1846-1870). The son of a minor French official stationed in Uruguay, Ducasse is best known for his novel-length prose-poem Les Chants de Maldoror, which became a kind of bible for the Surrealists. 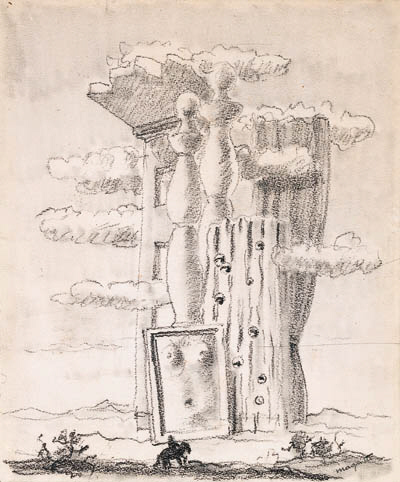 In 1938, an edition of his Oeuvres compltes was published, with an introduction by Breton and illustrations by many of the Surrealists, including Magritte. In 1948, an edition of Les Chants de Maldoror was published in Brussels with seventy-seven illustrations entirely by Magritte, for which the present lot is one of the original drawings. The tale follows the transgressions of the evil hero Maldoror, who exists in a state of constant metamorphosis, not only of identity (whether animal, vegetal or any combination thereof), but in time and space as well. Lautramont portrayed the connections between objects and reality as irrational, removing them from recognized functions and usual surroundings. As Suzi Gablik notes, "The poetic inspiration in Lautramont derives specifically from the rupture between imagination and good sense: cruelty develops in the context of peace; physical and biological nature are perverted; natural laws are transgressed. Everything is in perpetual mutation, somewhere between animal and human life. Moreover, the enigmatic images resist interpretation" (S. Gablik, Magritte, New York, 1985, p. 45). Certainly this must have appealed to Magritte, whose imagery, while not always so violent, thrived on incongruity and provocation. As a result of this conversation Magritte asked Torczyner to become his 'ambassador' to the United States.